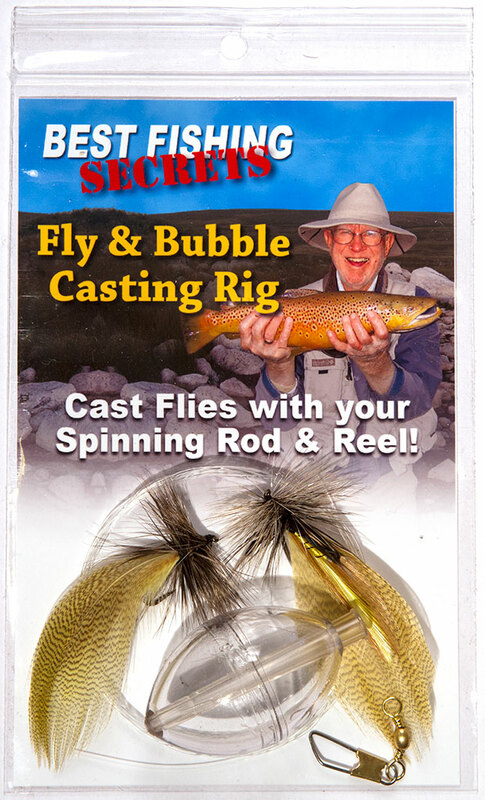 Best Fishing Secrets’ Fly & Bubble Casting Rig,lets you cast flies with your spinning rod and reel — and provides you with the exact components you need to be successful in one convenient package! With the Fly & Bubble Casting Rig, you can fish the surface…or fill the bubble part way — or all the way — and fish at different depths. Two patented Universal Flies are included. All of our Fly & Bubble Casting Rigs include complete instructions on how to set up your rig, including attaching the bubble, swivel and fly using a clinch knot. You can also purchase the Magic Bubble Casting Rig, which does not include the Universal Flies, so you can use flies of your choice.